Four years ago, I began building pinewood derby cars with my boys to enter in an annual race. 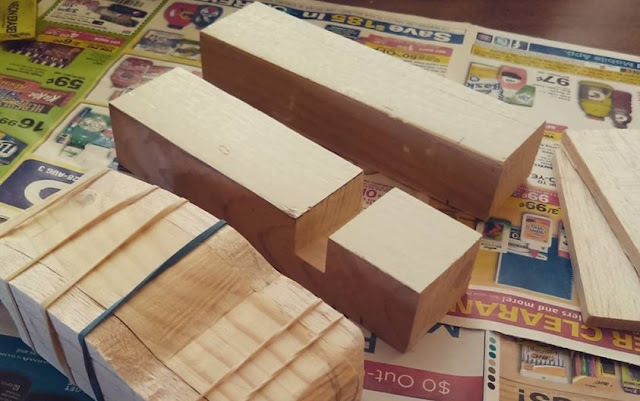 I've never really been much of a creative person but my woodworking skills have definitely improved over the years. 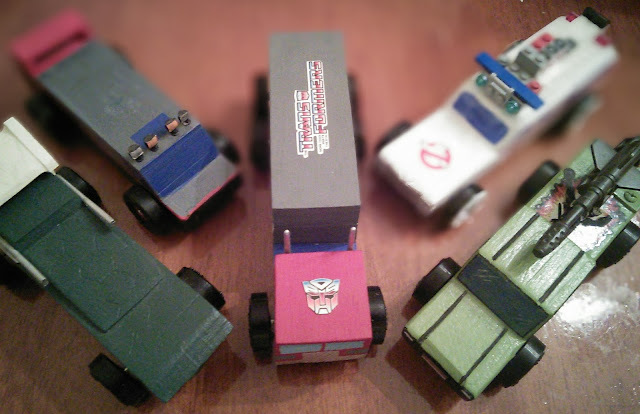 Each year I've built a car for myself, choosing a vehicle inspired by my childhood heroes. My first car was a G.I. Joe-inspired pickup truck with a massive gun on top that I found among some random vintage accessories. After I was pleased with the results and fresh off its 30th anniversary, the following year I designed an Ghostbusters Ecto-1 car with Lego accessories. 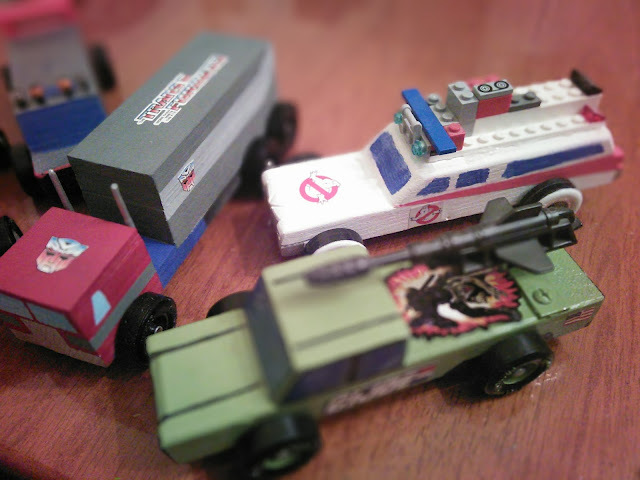 Last year was all about the vans with my boy wanting a TMNT Party Wagon and B.A. 's van from The A-Team for myself. 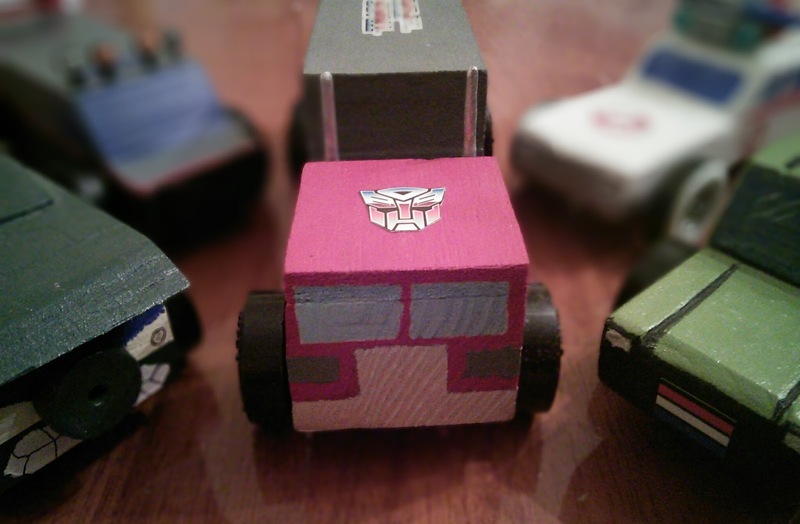 I had some pretty big aspirations of what to build this year, but after my boys told me what they wanted, I decided to do a simpler design for my car (err, truck) and give my fleet some leadership! My choice this year was a G1 version of Optimus Prime! Shown in the middle above, I took a standard size block and cut out a simple section to separate the cab from the trailer. 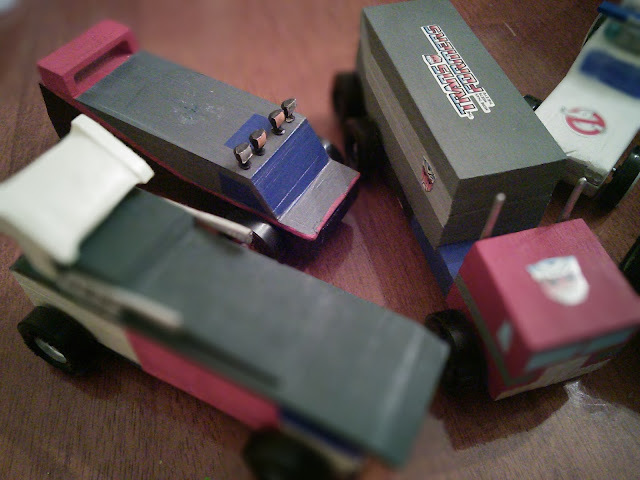 From there, I cut out some shapes from a plank of lightweight balsa wood to add height to both the cab and trailer. Considering the large crater I had to carve into the bottom of the truck to get it below the 5 ounce weight limit, using the balsa wood additions instead of just a larger wood block was the right move. 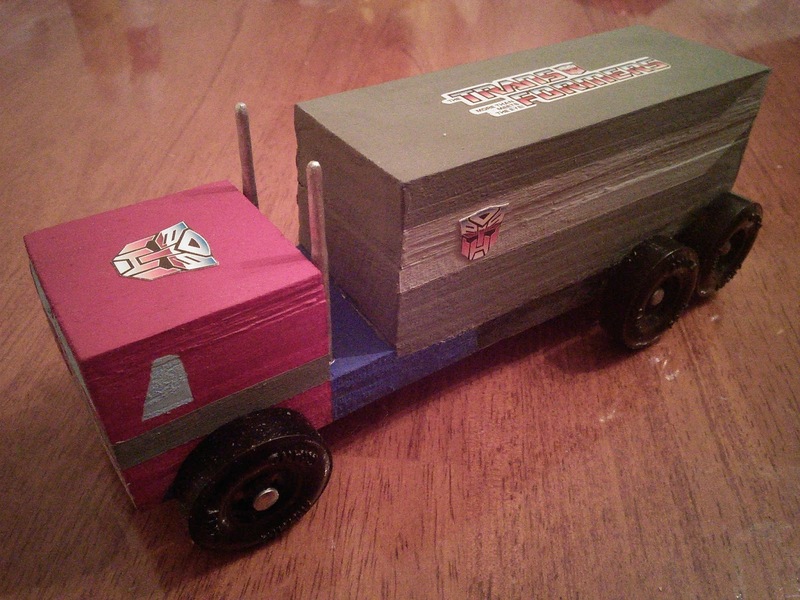 After using wood glue to adhere the balsa wood, it was onto painting Optimus. This was definitely my favorite part of the build since it was a rather simple design. I also picked up a sheet of G1 Transformers stickers at Hobby Lobby and used those images plus a few online to determine the colors and details. 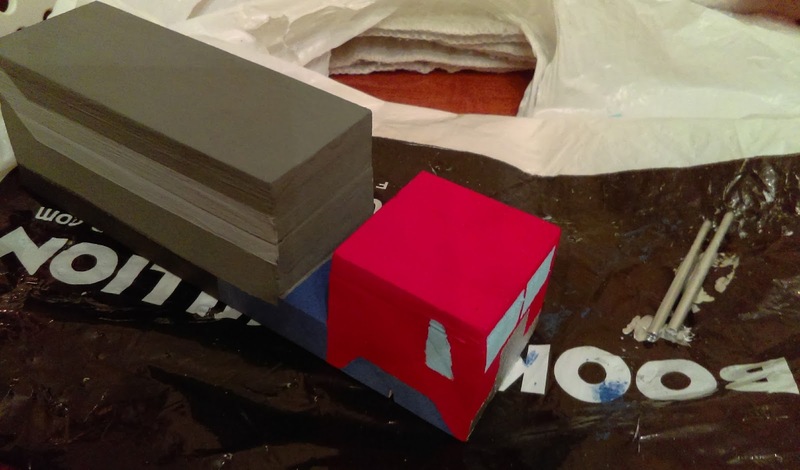 I used acrylic paint with a flat finish and began with red for the cab and gray for most of the trailer. I taped off the area for the lighter gray stripe on the trailer and also windows, grill, and undercarriage for the cab. Once the initial red and gray areas dried, I taped those areas off for the light gray trailer stripe and the blue undercarriage. Thinking about the original toy, I extended the blue underneath the front part of the trailer and used black for the rest of the length. I then used a metallic silver for the front grill and a light blue for the windows. After the fact, I forgot their was also a gray horizintal stripe on the cab so I shorten the side windows and taped off from the grill to the back of the cab. I also bought a small dowel to cut for the smoke stacks. I sanded the top half to be a little smaller and then painted with metallic silver. The final touches were adding two Autobot symbols from the aforementioned sticker sheet to the trailer. I'm not that great of an artist so instead of trying to draw the symbols on the sides of the cab, I used another large sticker on the roof and also a large logo sticker on the roof of the cab. Technically, derby cars are only supposed to have 4 wheels so for effect, I nailed two more wheels on the end of the trailer and at a slightly raised height. 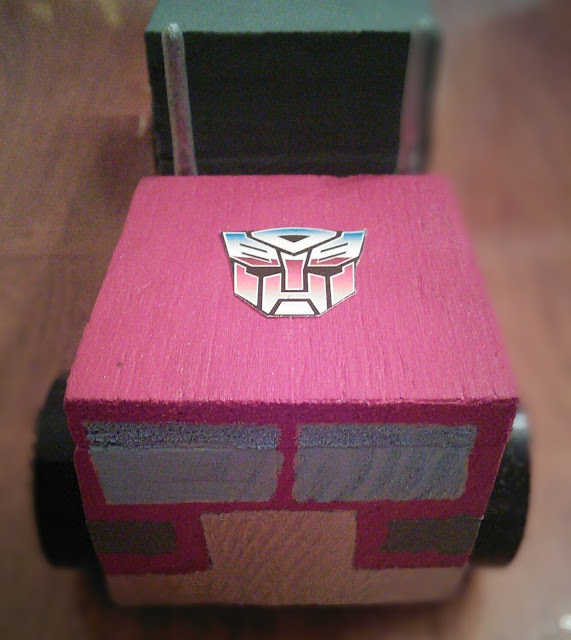 Overall, I was very pleased how Optimus Prime turned out. He definitely wasn't designed for speed and it showed at the race, but hearing compliments from several of my peers was all I needed to make my effort worth it! 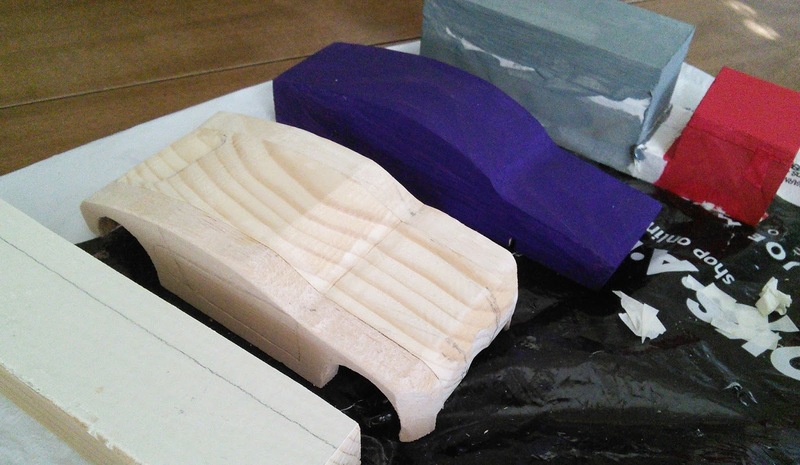 Leave a comment below if you want anymore details on the build like paint colors. If you also want to see more pictures including the other cars I built this year which included Pikachu from Pokemon and a Bugatti with side panels, follow Rediscoverthe80s on Instagram. Until next year, "Autobots, let's roll out!!!"